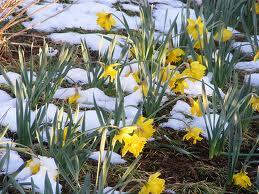 I spoke to my sister in London yesterday who told me that spring is in in the air. She works at a school, and she noticed that the children had finally emerged from their thick puffy coats and were running around the playground in t-shirts. Like seeds hiding beneath the frosty earth, they had found the courage to break out and unveil themselves. I do not have the pleasure of dancing to the rhythm of seasons now that I live in Los Angeles. I mourn the cycles that punctuated my year. The buttery yellow swarms of daffodil heads. The sudden rush of vibrant green stems and fields of fresh grass. The papery autumns filled with a thousand shades of orange. The crinkle and crunch of fallen leaves enveloping my feet. Then the starkness of winter. The bite on my cheeks. The bareness of branches reminding me that mother nature so accurately mirrors human nature. A familiar cycle of moods. Light to dark. Empty to full. Birth to death. And then again. And then again. Holding onto hope after a loss can feel impossible. Improable. A blurry destination hovering in the far off distance. Grief is arresting. Like a sudden winter it descends with a million bitter promises. I will strip you down. Freeze your heart. Darken your skies. Disect the sun. There are no platitudes to brighten the bleakest periods of our lives. But there will always be the arrival of spring. Even here in Los Angeles the jacaranda trees are preparing to burst out in eccentric purple blossom creating boulevards of bloom. Loss is permanent, but grief, like the seasons changes temperature. It is hard to imagine this when the chill has just descended; difficult to trust that spring will come again and that somewhere in the world there will be children, peeling off their coats, ready to embrace a warmer day. Writing about loss is both painful and healing. We often bury the most tender words for fear of unearthing more grief. Ironically, it is when grief is given air that its temperature can change. Share a story of loss… like all emotions, grief is a human connector… a universal experience that touches lives everywhere.